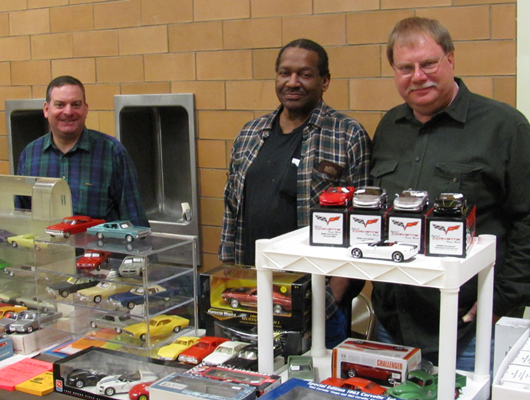 A nice display of new and vintage scale promotional cars for sale. Note the five great looking Chevrolet Corvettes on the white table. This show always has a great turnout. 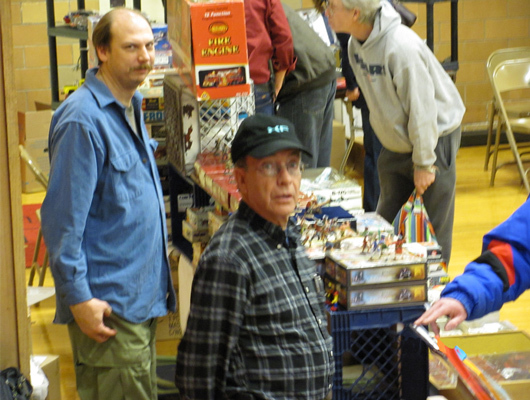 The aisles are filled with buyers and there is always a great selection of merchandise at each table. 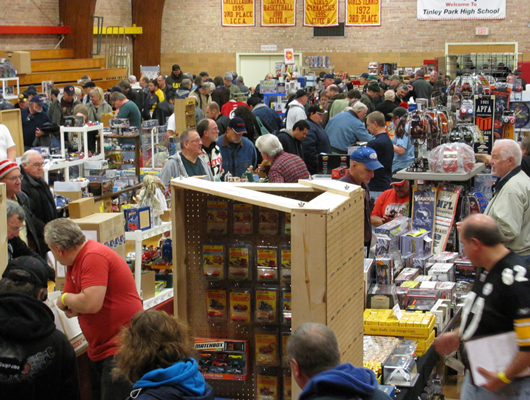 Tonka trucks, Matchbox cars, Hot Wheels, antique dolls, collectible toys, and vintage model kits were just a few of the items moving at the show. 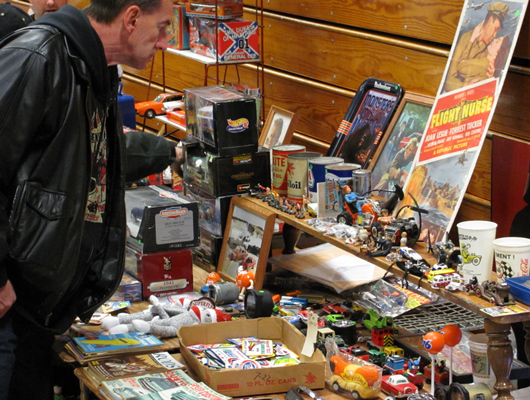 Talk about a large selection of items this vendorhad movie and racing memorabilia, as well as alarge selection of toys. Not to mention an eight foot long Sinclair gasoline dinosaur! 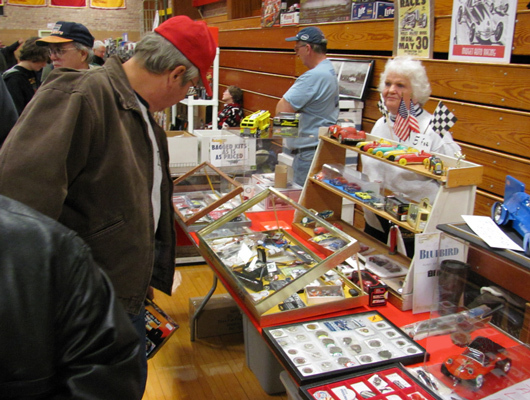 Racing posters, pins and medals, old metal and plastic toys filled this table with many interesting items that made you stop and look. 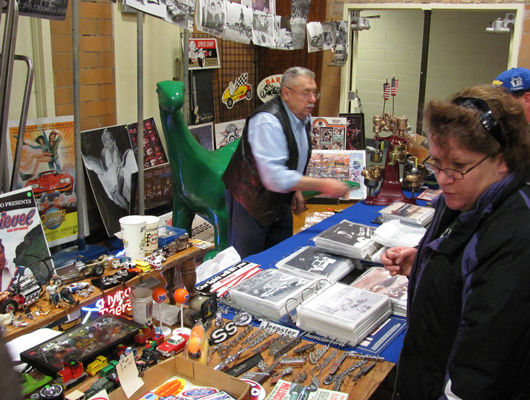 A visitor inspects the treasures set up on this table closely. You just never know what you might find unless you take the time to take it all in. 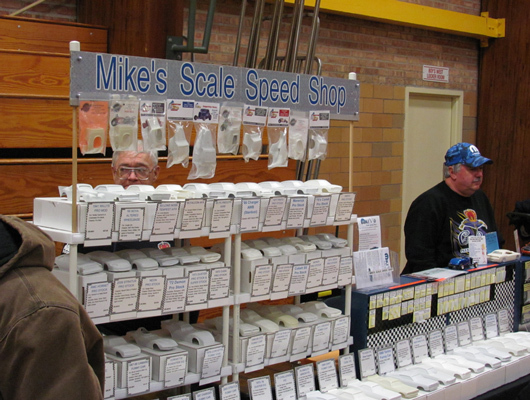 Mike’s Scale Speed Shop will sell you everything you could possibly need to build your own custom resin model car. 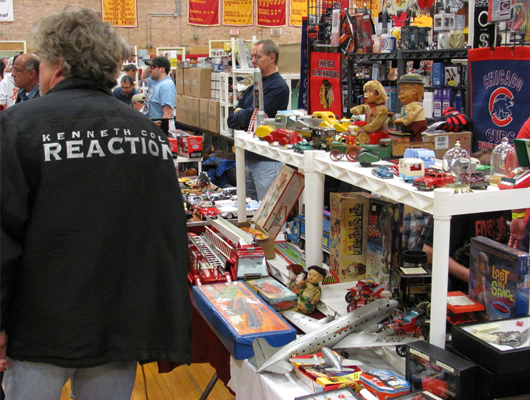 Old battery operated toys, Tonka trucks, airplanes, vintage model kits, and other old toys were for sale on these tables. 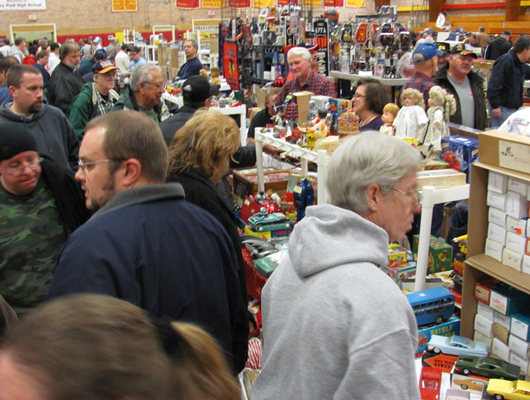 Shoppers flood the isles at The Tinley Park Annual Holiday Toy Show. None of them came here to “Mall Walk” They are all here because of their interest in what you have to sell. Don’t be left out in the cold, participate in one of our shows! These two vendors look like they belong on “Americas Most Wanted” although they are some pretty nice guys, and are always willing to deal! 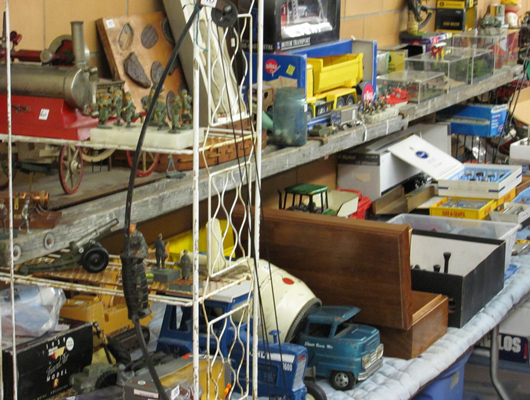 A wide assortment of older toys including old trucks, lead soldiers, a steam powered toy, farm tractors, and many parts for toys.